This entire winter I could tell my hair was craving more moisture. My easy fix was adding treatments and oils, but I didn't realize how parched it was until I used the Dessange Nutrition Elixir line. The shampoo, conditioner and hair mask brought my hair to a whole new level, even after coloring! I'm not one to "ooh" and "aah" over shampoos and conditioners, but when I find ones that completely transform my hair, I have to share! The best part is, you can find the Dessange line right at Target, and online. I'm always ordering online from Target, whether it's household basics or everyday personal care. It's so convenient. And many items are available for subscription and sent on a schedule you set. PLUS now through Saturday March 25th, select haircare at Target is buy one get one half off! Now, on to the products! Shampoo + Conditioner | These are not your typical hydrating shampoo and conditioner. What makes these special is that they are infused with Sacha Inchi oil. This oil is rich in omegas and nourishes deep down so you notice softer, silkier hair instantly. I loved the feeling of my hair even after shampooing, it was amazing. The conditioner was particularly rich but didn't weigh down my hair at all. And the smell? I can't get enough. If it came in a lotion I would love that! Mask | For even deeper hydration, this mask can be incorporated into your routine in place of the conditioner. I use this mask once a week. You just apply from the mid-length to ends, let sit for a few minutes and rinse. And yes, it has the same amazing scent as the shampoo and conditioner. I love getting an extra boost of moisture without the weight or greasy feeling. I didn't even have to use as much hair serum. Love. Color Correcting Creme | After going to the trouble of coloring your hair at home or at the salon, the last thing you want is to have your color fade faster than it should. The Dessange Color Correcting Creme gets applied at the roots to revive your hair color. There is a blonde formula as well as brunette formula, which I have. The brunette formula contains green dyes which combat ginger and orange tones which can leave hair looking brassy. With weekly use of this creme, your rich brown will stay truer, longer. After using this line continuously, I was amazed how healthy, hydrated and silky my hair looked and felt. It made me actually like blow drying my hair again! If your hair is in need of some major TLC, I highly recommend checking out this collection at your local Target. Check out the entire line below, on Target.com. 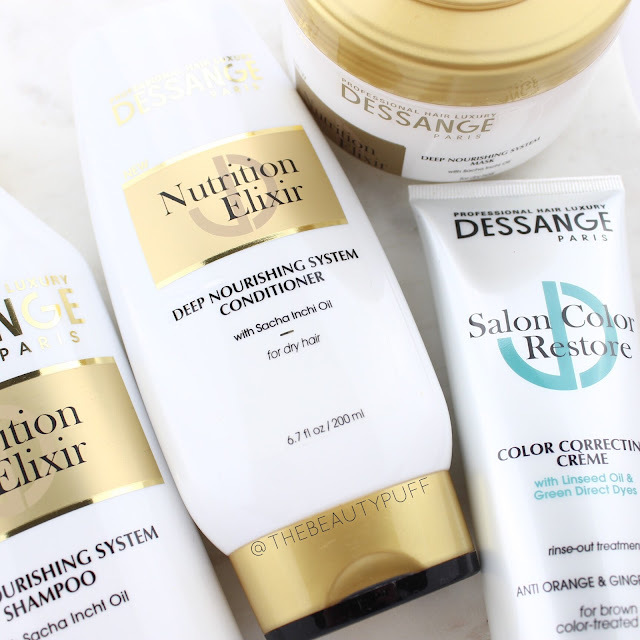 Now through Saturday March 25th, select Dessange products (including those mentioned in this post!) are buy one get one half off!